Advances in health technology through Remote Care Management and Telemedicine are set to make waves in the local healthcare sector. The technology and enabling devices were showcased at the recently concluded Medical Association of Jamaica (MAJ) Symposium and Awards Banquet by AIS (Advanced Integrated Systems), the leading healthcare technology provider in the Caribbean on June 9-10, 2017. The MAJ Symposium facilitates businesses in the healthcare industry showcasing their products and new technology each year. This year’s event was held under the theme “Trauma: A national public health problem – The research and our solutions”. AIS is working with the University Hospital of the West Indies to fully digitise their entire operation using PAS-HIMS and with a number of local medical practices to customise PAS-MD for ideal use in Jamaica. AIS is in the process of installing the Hospital Information Management System (PAS-HIMS) at the University Hospital of the West Indies. They also recently launched Medical Practice Management System (PAS-MD) and the information on patient’s health can be uploaded to the Electronic Medical Records (EMR), which are expected to be in place soon starting with the UHWI. 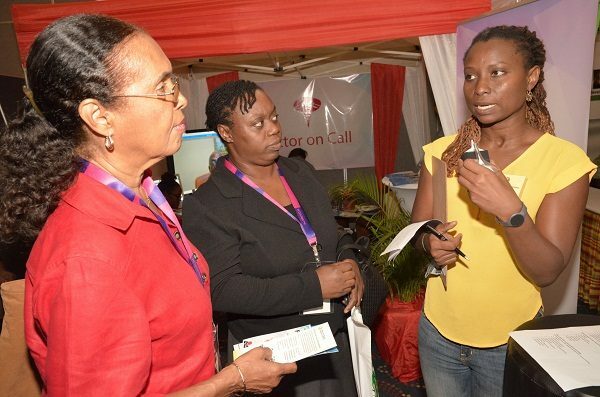 AIS markets telemedicine devices can be integrated with these platforms to significantly assist in the diagnosis and management of Non-communicable diseases which are now a global problem which affects many Jamaicans. The devices include Dyno 50, which is a digital health monitor, a Bluetooth enabled blood pressure monitor and the Adore smart composite scale manufactured by DynoSense and will be distributed by AIS as reported in AIS and Dyno Sense heralds Telemedicine Future of Health Care in Jamaica. Detect hypertension including the degree that is has reached. By stepping on the Adore smart composite scale, a person can obtain their weight, body water, body fat, body mass index, body metabolic rate, bone density, visceral fat and muscle mass. clearly, this is the future of medicine a so much intel can be garnered from one device as pointed out by Chairman and CEO, AIS, Doug Halsall, quote: “With Dyno50 for example by breathing normally through the devices in less than a minute it can provide more than 15 health metrics including electrocardiogram, heart rate, heart rate variability, oral temperature, blood oxygen saturation, systolic and diastolic blood pressure, mean arterial pressure, arterial stiffness index, atrial fibrillation, atrial tachycardia, atrioventricular, premature ventricular contraction, premature atrial contraction and galvanic skin response”. Telemedicine open the doorway to AI System taking care of humans at home, reducing hospital stays and modernizing health care and improving patient recovery.